Wednesday was not a good day for Celtic. Good fortune seemed to slip away from them as the day progressed. In the morning we were still digesting the damning comments made by Brendan Rodgers to the media the day before about the club’s acquisition of players. It came across as though he was having a dig at the board and in all honestly probably was. Then came the McGinn blow. Regardless of which camp you are in, his move to Villa did not go down well. Multiple articles emerged about this whole fiasco. For a story that never seemed to go away, it has amounted to nothing for Celtic. I was never in the camp that was in favour of signing him. Some Hibs fans didnt’ even think he was their best midfielder last season – that was Dylan McGeouch. And for those who watch a lot of Scottish football, McGinn wasn’t even the best midfielder out with Celtic Park. Many will tell you that was Ryan Christie. Now we are of the opinion that Celtic dragged their feet on the deal and were penny-pinching. We’ve been seen to doing that before with guys like James McFadden, James McArthur and Steven Fletcher before all opting to move south so it will be hard to change fan perception that this isn’t the case with McGinn. So my question is this. Whether Celtic met the asking price or not, did these guys even want to come to the club or were the bright lights of English football always the end game? It is not out with the realms of business for another Scottish club to amp up interest by using Celtic as a bargaining tool. If Celtic show interest, English clubs will be interested and if that is where a players wants to go to earn the big money then that is what will happen. I have no idea of the negotiation timeline, but up until it was announced McGinn was down at Villa having discussions, none of Celtic’s bids had reportedly been accepted. Neil Lennon was also claiming that he was surprised there was no interest from down south. And before you know it.. bang! McGinn is down south, having a medical, discussing terms. Then we are told that Celtic DID meet the asking price. The question is when? After Brendan’s comments to the media or before McGinn was even down at Villa? And if they did and McGinn really wanted to come to Celtic wouldn’t he have? I’m guessing Villa would have offered more money as I don’t see Celtic shelling out the same. Certainly not until after he had proven himself in the Hoops. My gut feeling is that he was always going to go south just as McGeouch, Armstrong and all of those before have. As we don’t really know who the negotiations went, I am loathed to blame Celtic over this even if Brendan thinks that they did. This entire episode has dragged on for months. It has now cast a shadow over Celtic Park and was probably on the minds of many going into last nights game. Not so much the players, but the management team and the board of directors. 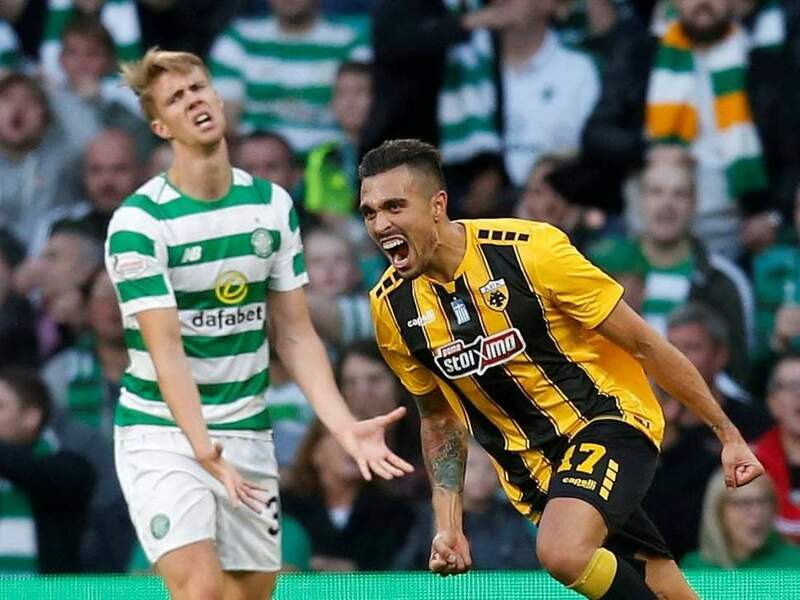 The 1-1 result against 10 man AEK Athens just about summed up the last 48 hours. The game started brightly but the lights dimmed and half the team were working hard whilst for the rest it just wasnt’ happening. The spark was missing and AEK were sitting tight. It is their style and we failed to break it. Tierney and Ntcham were out best players on the night with moments from McGregor who scored and Forrest who wasn’t as lively as usual until the second half. Edouard’s first touch and control were totally absent. Brown’s passing and fierceness were also missing. At the back, Ajer and Hendry were weak. Lustig was almost totally absent. Rogic started brightly but even he wasn’t at the races. Griffiths came off the bench and made a huge impact. Sinclair came off the bench and did exactly the opposite. The game had been slipping away from Celtic from as early as the 35 minute. The mountain for Celtic to climb is challenging. Having failed to win and lost an away goal, they must turn the match around in Athens or we’ll drop down to the Europa League Play-Off. I don’t think AEK are unbeatable. It all depends on whether we turn up in Athens though. That means the management team putting aside their obvious disappointment of McGinn moving to Villa and motivating the players that we have available. Boyata or Simunovic will come in for the suspended Ajer whilst Griffiths is likely to play either with or instead of Edouard after the Frenchman’s poor showing last night. New faces will appear for Celtic soon. We won’t see any of them right away though, at least not in Europe. Our next match is on Saturday away to Hearts. What better way to motivate your players and supporters than to visit Tynecastle? Last night was awful. The entire back four were dreadful. Hendry was abysmal. KTs mum must have picked the man of the match. There was barely a decent ball into the box all night. We just didn’t look like we’d have got the second even if they’d left the field. I’m a big fan of McGregor, but I don’t think he is effective out wide. Would have preferred Griffiths or edouard out there. Rodgers made mistakes with his selection last night. They didn’t look great, but look like they can shut us out over there. Bad day at the office? If you had a day as bad as this in an office, you’d be dragged in front of HR!!! !